Welcome to the Scirocco Apartments on Santonrini! 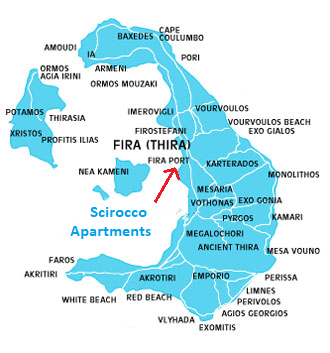 The Scirocco Apartments are situated in the heart of the traditional Caldera area on the cliffs at Fira, the main village of the island. The 17 units (studios, apartments & cave houses) are on 6 levels landscaped into the cliffs & claim a unique central location on the slope. The complex provides also a small reception / breakfast terrace and a swimming-pool out to the open with full views. … Put in the legwork. 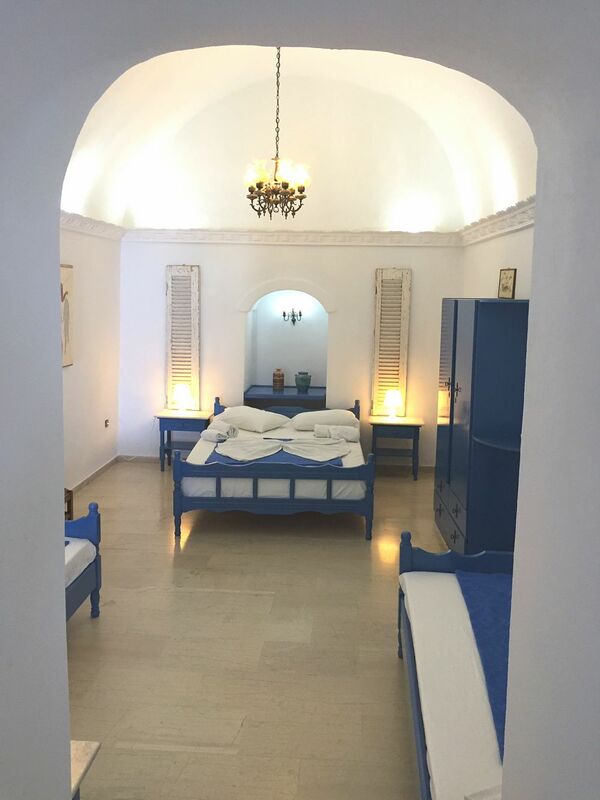 If you’re willing to put up with, say, 100 extra steps to get to your room, you can have Santorini’s swoon-inducing caldera views without blowing the kids’ inheritance: Scirocco’s spacious studios have it all, and a pool, at a quarter the price of its neighbours. … If you can spare the Caldera view, you can find affordable accommodation on the island Angelina Jolie choses for vacation. Package tour hotels are found in the east, but even in Fira you can find B&B rooms and even a camping ground. When traveling in high season, you should book in advance. Prices along the Caldera are usually high, if not astronomical. Creditable exception and wholehearted recommendation: the Scirocco in Fira. 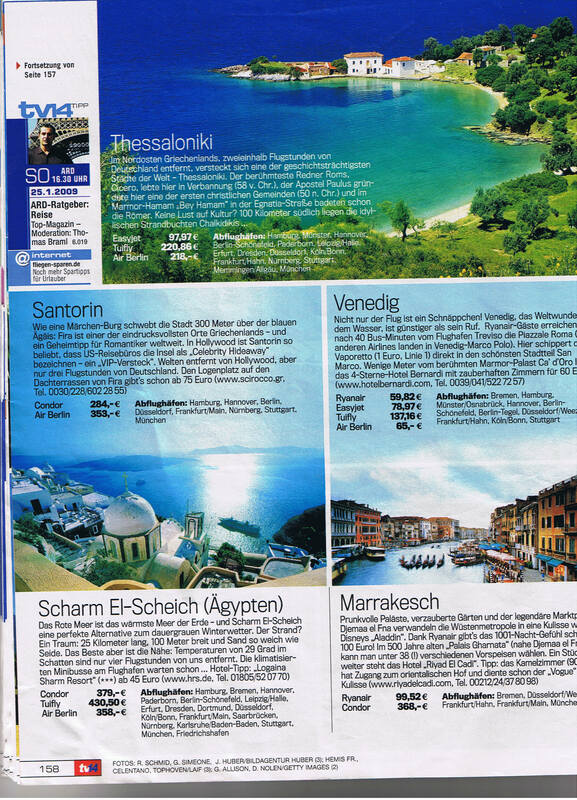 Anja from Bielefeld (Germany) and her Greek husband offer 17 affordable rooms with balconies and adorable view. 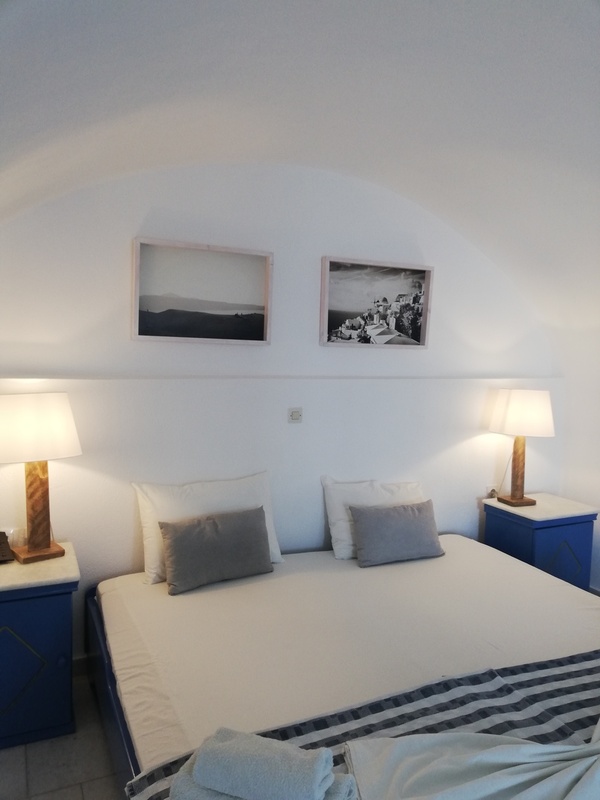 Rooms, apartments and cave houses, all with balconies and Caldera views, are found in the Scirocco in Fira, small and friendly hotel with pool in a traditional environment, run by a lovely Greek-German couple. The Scirocco is situated in the heart of the traditional caldera on the cliffs at Fira, the main village of the island. A full panoramic view of the caldera, sunset, volcano and sea are guaranteed from it’s balconies. From this unique spot a ca three minutes walk to the center connects you with all local amenities, such as the main supermarket, shops, good bus connections across the island (beaches, villages), taxi stand, banks, post office, tourist offices, car and bike rentals, pharmacies, restaurants and night life. This location is a good base for a memorable holiday. Some guides point it out as a ”secret advise”. Units are decorated in the traditional island style. Each one is air-conditioned, provides a fridge, in order to prepare a snack a few dishes, kettle etc. is provided (some of the rooms have a hot plate), shower/wc,hair dryer, telephone, free of charge wifi internet connectivity from it’s balconies,own balcony at the caldera-sunset-volcano-sea view. Each unit has it’s own characteristics. Take a virtual tour showing Scirocco Apartments and it’s sourroundings! For 2-5 pers. 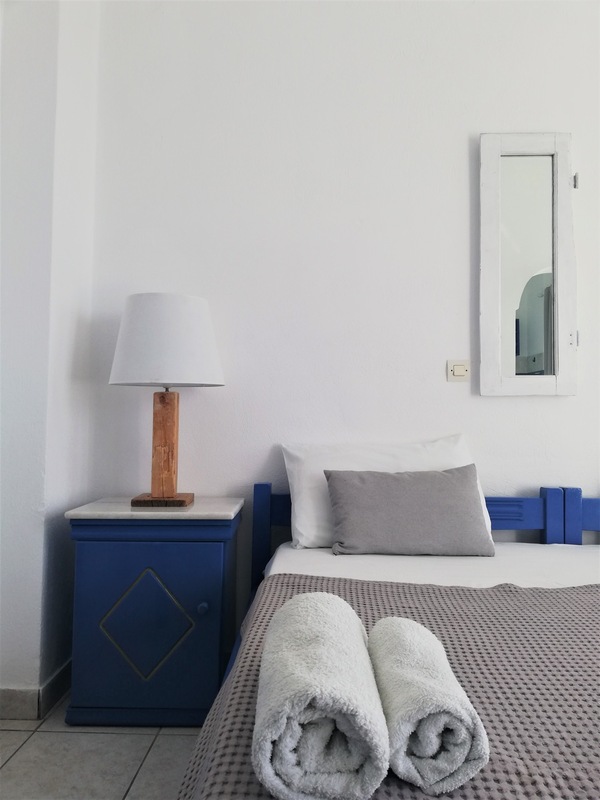 with 1.5 – 2 rooms, air-conditioning,shower/ec,hair-dryer, fridge,sink,in order to prepare a snack a few dishes ,kettle etc provided,telephone,free of charge wifi connectivity from it’s terraces, own terrace facing the caldera-sunset-volcano-sea view. Some provide a hotplate. For 2-5 pers.,spacious unit,build inside the rock,some provide a loft, round ceilings, 2 are situated side by side, perfect for a community holiday, air-conditioning , shower/wc ,hair-dryer,fridge,sink,in order to prepare a snack a kettle etc. is provided,some have a hotplate,telephone,free of charge wifi internet connectivity from it’s balconies, own balcony facing the caldera-sunset-volcano-sea view. The Scirocco is a family run complex. Eleftherios & Anja Sirigos, he local (born at the Caldera) ,she German & their adult daughters Christina & Elena who were brought up in spirit of hospitality plus experienced team will make you feel welcome right from the beginning of your stay. We would be glad to have you here! 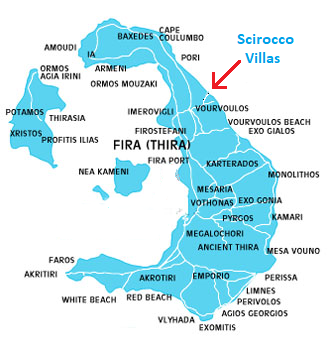 Also visit our partner hotel Scirocco Villas on the east coast!